Lynda was born in Swansea. She obtained an Honours Degree in Law at London University and then studied for the Law Society Final Examination at The College of Law in Lancaster Gate London. Lynda returned to South Wales in 1983 to train as a Solicitor. When applying for articles she ensured that she chose a practice that undertook publicly funded work. In 1988 she became both a Court and Police Station Duty Solicitor and thereafter took over the role of administrator of the East Gwent Duty Solicitor Scheme. 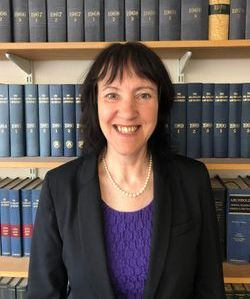 Having gained experience in Crime, Family, Conveyancing, Probate and Wills Lynda joined Gartsides Criminal Team in 1999 working initially in Ebbw Vale and thereafter in Newport where she is now based. Lynda is an Equity Partner at Gartsides. She appears in Court on a daily basis dealing with all types of Criminal Litigation and provides advice and assistance to clients being interviewed in accordance with The Police and Criminal Evidence Act. Lynda strives to provide well balanced advice to all her clients and to represent them to the best of her abilities. Lynda has been rated by The Good Lawyer Guide with 5 Gold Stars for outstanding Legal Practice.